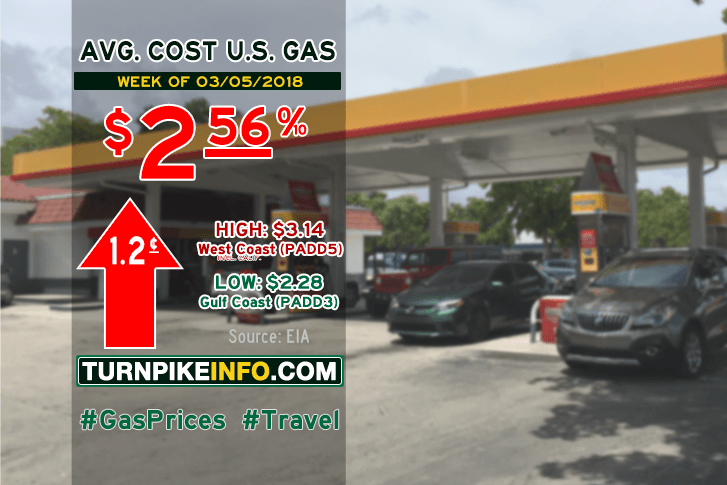 Fort Lauderdale, FL – After three weeks of price declines, drivers were hit with an increase in costs at the pump this week, according to the U.S. Energy Information Administration. The E.I.A.’s weekly fuel price survey shows the average cost of gas for Americas’ drivers went up by over a penny per gallon. The nation’s average price for a gallon of regular unleaded is now $2.56, according to the weekly report. Price declines of identical amounts were felt in the New England states, as well as in the Central Atlantic and Rocky Mountain regions, the E.I.A. reported. But price increases across the Midwest, the Gulf Coast, and the Lower Atlantic states weighed heavily on the nation’s price averages this week. Truckers kept getting a break in prices, though, bucking the gasoline trend this week, the E.I.A. reported. The survey report shows the average cost of diesel dipped by well over a penny per gallon to settle below $3.00 for the first time since the beginning of 2018. Average diesel prices, nationwide, are $2.99 per gallon, according to the E.I.A. Fuel prices for all regions are shown below, as gathered from www.eia.gov.